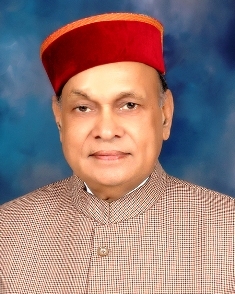 Prem Kumar Dhumal, Chief Minister stressed the need for participation of every section of the society for the development of the nation. He was speaking on the occasion of inauguration of Vishwa Hindu Parishad (VHP) office at Chakkar here today. Chief Minister participated in the inauguration ceremony of VHP office. He also inaugurated website of Vishwa Hindu Parishad, Himachal Pradesh and Computer Room of the Parishad. He said that every person should participate for the welfare of the people. He said that overall development of the society could be ensured by working in unison manner. Chief Minister congratulated Vishwa Hindu Parishad for owning its office in Shimla. Prof. Dhumal and Shri Dinesh Chander, International Organising Secretary, VHP distributed books and school bags to the children and honoured different organizations on the occasion. Dinesh Chander also spoke on the occasion. Vimla Kashayp, MP, Dr. Rajeev Bindal, General Secretary, State BJP, Shri Suresh Bhardwaj, MLA, Shri ADN Vajpayee, Vice Chancellor, H.P. University,M.P. Sood, Commissioner, Municipal Corporation, Shimla, senior office bearers of VHP and other organizations were present on the occasion.